New York City boasts cherished Art Deco skyscrapers, amazing bridges, iconic luxury retailers, legendary Broadway theaters and world-class parks. New York is a city of superlatives; it exerts a temendous impact upon commerce, finance, media, art, fashion and entertainment. 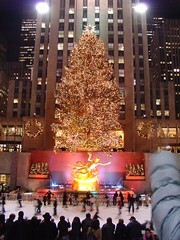 Who doesn’t love New York at Christmas? 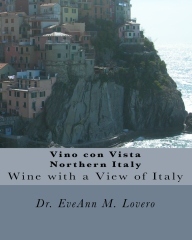 Christmas is my favorite time of year to enjoy a spectacular Vino con Vista weekend on the island of Manhattan. New York’s amazing iconic landmarks are bejeweled with sparkling lights and lavish holiday ornamentation. I like to stay in Midtown Manhattan. 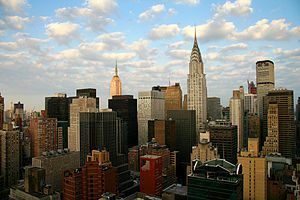 This area has some of the city’s tallest and most famous buildings including: the Empire State Building and the Chrysler Building. 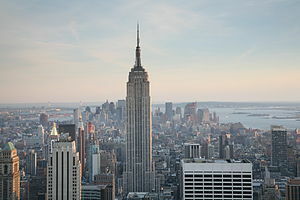 It is also the home of Rockefeller Center, Broadway and Times Square. I love the soldiers in Rockefeller Center and the museum quality windows at Bergdorf Goodman. The magnificent four-faced antique Statue of Liberty clock in the lobby of the Waldorf-Astoria Hotel is exponentially more lovely when she is cloaked with golden garland. My spectacular Vino con Vista Holiday weekend started in Midtown Manhattan. We took the shuttle from LaGuardia, dropped our luggage off with the Bellman at the Grand Hyatt next to Grand Central Station and began our holiday adventure. The hotels in Midtown offer the perfect location for exploring the Big Apple. 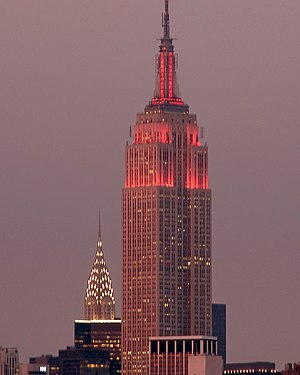 The two best places for a panoramic view of the city are the observatories at the Empire State Building and at Rockefeller Center‘s Top of the Rock. Take the elevator to the Top of the Rock Observation Deck; it opens at 8 am and closes at midnight; the elevators go upstairs until 11 pm. The deck provides one of the best views of New York City’s legendary skyline and cityscape, which features more than 100 buildings measuring 500 feet or taller. You can even see the Statue of Liberty. 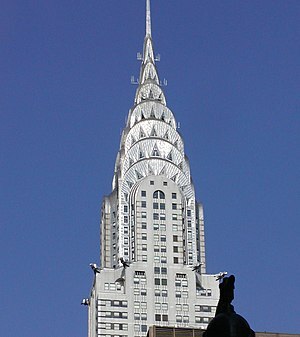 Another one of my favorites is the landmark Art Deco Chrysler Building. It has 3,862 amazing windows in various shapes and sizes. 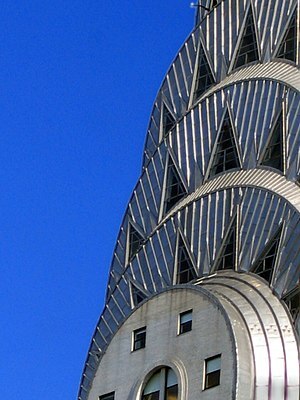 I love the magnificent stainless steel terraced crown. The corners of the building on 61st floor are graced with eagles. “On the 31st floor, the corner ornamentations are replicas of the 1929 Chrysler radiator caps.” When the building first opened, it contained a public viewing gallery on the 71st floor, which was closed to the public in 1945. Our first official holiday destination was the National Historic Landmark Rockefeller Center between 48th and 51st Street in Midtown Manhattan. This area is a complex of commercial buildings that are brimming with public art and holiday ornamentation. I love seeing Santa and the ice skaters in front of Paul Manship‘s gilded bronze statue of the Greek legend of Prometheus who stole fire from heaven for mankind. 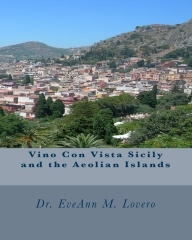 As a punishment, he was chained to a rock, where an eagle devoured his liver during the day. It was made whole again at night. He was released by Hercules. I also love the statue of Atlas sculpted by Lee Lawrie. In Greek mythology, he supports the pillars of heaven on his shoulders. Lawrie created the friezes above the main entrance to the RCA Building. Many artists have contributed to the art in and around Rockefeller Center including: Carl Milles, Hildreth Meiere, Margaret Bourke-White, Dean Cornwell and Leo Friedlander. My next stop was the flagship MoMa Store. I love the holiday selection. Check out the “Christmas in New York Pop Up Book” by Chuck Fisher and the Chrysler Building Puzzle. They have an extensive children’s assortment including some of the books that I gave my sons when they were young. There are plenty of holiday ornaments and specialty Advent calendars. This museum store also sells prints of featured works from MoMA like Jackson Pollock and Jasper Johns. They stock dining and home decor products, jewelry, accessories and The Obsessive Chef cutting board. 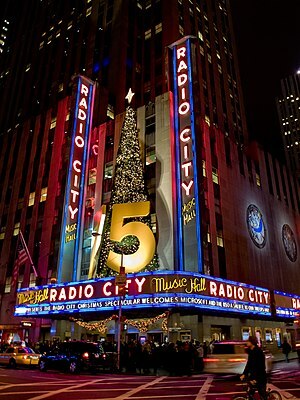 I actually fell in love with New York City when I was a little girl and my Dad took me to see the amazing Radio City Christmas Spectacular. 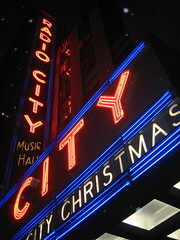 The Radio City Music Hall is located at 50th Street and Avenue of the Americas. I actually aspired to become a Rockett some day. Try to get tickets for this performance because it’s fun to “Rock out with the Rockets.” This precision dance routine has been performing at this venue for 85 years. The opulent theater was completed in December of 1932. The show features over 140 performers, lavish sets and spectacular costumes with an original musical score. There’s 90 minutes of singing and dancing. 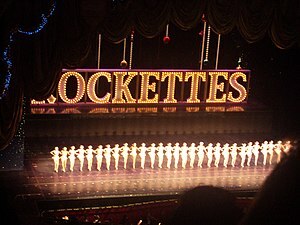 The 2012 production is The Rockettes Celebration! 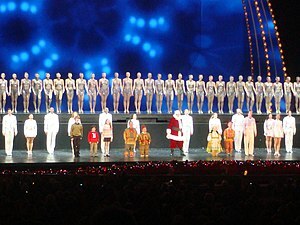 for the 85th anniversary of the Rockettes and the 80th anniversary of the Christmas Spectacular. The show is scheduled to run from November 9th through December 30, 2012. It’s finally time for lunch, so we headed over to Fabio Piccolo Fiore at 230 East 44th Street www.fabiopiccolofiore.com. We loved the replica artworks on the dining room walls of Renaissance artists including: Leonardo da Vinci, Bronzino and Raphael. We ordered the lunch special. The house antipasto, grilled artichoke hearts and veal marsala were outstanding! If you’re lucky, you will get to talk to handsome Chef Fabio about Rome and his fantastic Italian recipes. Chef Fabio Hakill was born in Rome. After lunch, it was finally time to check into the Grand Hyatt. We put our luggage in the room and headed over to the Grand Central Terminal for an self-guided architectural tour and culinary adventure. The Dining Concourse, below the Main Concourse and connected to it by numerous stairs, ramps, and escalators, provides access to the lower level tracks. It has central seating and lounge areas, surrounded by restaurants.This is a haven for Foodies!! There are various food outlets surrounding the Dining Concourse on the level below the Main Concourse including: delis, bakeries and specialty cheese purveys surrounded by gourmet and fresh food vendors. We launched our journey by admiring the incredible facade facing 42nd Street. The clock in the center has a circumference of 13 feet and it is surmounted by sculptures carved by the John Donnelly Company. The figures are Minerva, Hercules and Mercury. This magnificent 48 foot sculpture was designed by the French sculptor Jules-Felix Coutan in 1914. There’s much more to Grand Central than train platforms. You can visit the annex of the New York Transit Museum and shop at more than forty retail stores including an Apple Store which opened to the public on December 9, 2011. 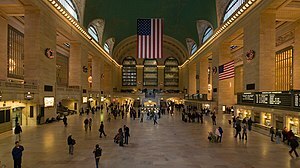 Grand Central Terminal has plenty of restaurants, such as the iconic Oyster Bar (Grand Central’s oldest business). The Oyster Bar is crowned with Guastavino tile vaults. The cavernous main Concourse is the center of Grand Central. In 1998, a 12-year restoration of Grand Central revealed the splendid details of the elaborately decorated astronomical ceiling. There is an opulent four-faced opal clock on top of the information booth. Within the Terminal’s marble and brass pagoda lies a “secret” door that conceals a spiral staircase leading to the lower level information booth. Well, it’s just about time for a proper New York City Vino con Vista Happy Hour, so we headed over to the Campbell Apartment for some “Cocktails from another Era.” The Campbell Apartment is an elegantly restored cocktail lounge, located just south of the 43rd Street by the 15 Vanderbilt Avenue entrance. The Vanderbilt family built and owned the station. The Campbell Apartment was the former office of 1920’s tycoon John W. Campbell. He was the Chairman of the Board of the Credit Clearing House prior to 1941. 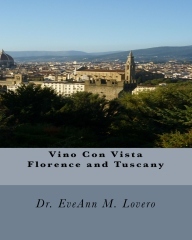 He transformed his 30 foot by 63 foot office into a “galleried hall of a 13th century Florentine palace.” It is packed with priceless antiques. The Campbell Apartment has a magnificent 25 foot timbered ceiling. It’s finally time for dinner! We headed over to Commerce at 50 Commerce Street in trendy West Village. 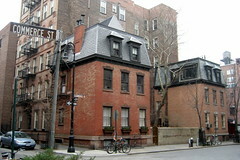 The West Village is the western portion of the charming Greenwich Village neighborhood. I loved the cuisine but the artwork was truly captivating! Dine and admire David Joel’s Sister’ Story; I love the large murals that he painted in this restaurant.painted by David Joel. 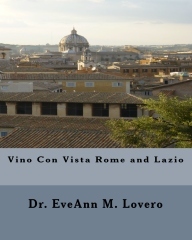 For more information about the murals visit www.drdavinci.com. I had to “Give my Regards to Broadway!” I love the brightly illuminated Theater District and Times Square; it is truly where the city never sleeps. The city’s 39 largest theaters (more than 500 seats) are collectively known as Broadway; named after the main artery that crosses the Times Square Theater District. Nobody does live theater like London and NYC! There is always a season of the star-studded revival, with Death of a Salesman, starring Philip Seymour Hoffman; Evita, featuring Ricky Martin; and The Best Man, whose cast includes James Earl Jones, Candice Bergen, John Larroquette and Angela Lansbury. Visit the TKTS Discount Booth in Times Square for discounted tickets to some shows. Climb the red steps for a panoramic vista of Times Square. We walked over to the box office of the Schenfeld Theater at 236 W. 45th Street to snag some matinee tickets for Glengarry Glen Ross because we were dying to see Al Pacino play Shelly Levene and Bobby Cannavale as Richard Roma. 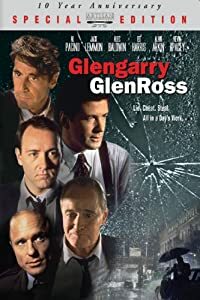 Glengarry Glen Ross was a 1992 American film that was adapted by David Mamet from his acclaimed 1984 Pulitzer-Prize and Tony-winnint play. This is a depressing tale of Chicago real estate agents who are trying to sell land in Florida in the early 80’s. I usually prefer musicals but seeing Al Pacino on Broadway playing Shelley Levene, a once-successful salesman now in a long-running slump an is a once in a lifetime experience. So we paid $152.00 for a Box Seat at the 2:00 Saturday performance. The best Broadway Musical I ever saw was “Annie Get your Gun” with Reba MacEntire. Just thinking about it makes me want to belt out Irving Berlin’s “You Can’t Get a Man with a Gun”! The hub of the Broadway theater district is one of the world’s busiest pedestrian intersections! We even caught a glimpse of a bride and groom in the middle of Times Square. We did stumble upon an interesting place in the Theater District that I have never seen before. 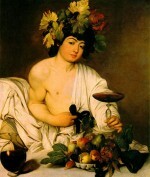 Try to have a drink or stay at the fabulous Night Hotel at 132 W. 45th Street www.nighthotel.com. This sleek black and white boutique hotel in in Times Square and was voted ” the Sexiest Hotel in the US” by the editors of Trip Advisor. We had some time before the show started so we scurried over to Saint Patrick’s Cathedral on Fifth Avenue, across from Rockefeller Center to light candles and see the Nativity Scene inside the church. When we arrived, we saw the scaffolding covering the building. It is under-going an extensive rehab and restoration. We walked inside to admire the magnificent Gothic Cathedral. It is the largest Gothic Catholic cathedral in the US. St. Patrick’s Cathedral is the Mother Church of the Archdiocese of New York and the seat of the Archbishop. This international landmark was dedicated in 1879 and welcomes more than five million visitors each year. It has 330-foot spires and can hold 2,500 worshipers. I love the side chapels, numerous altars and stained glass windows. The giant 7,300 pipe organ is incredible! I had to pay my respects to Saint Anthony and Saint John Baptist de la Salle; the patron saint of my University. Like most great cathedrals, St. Patrick’s Cathedral was paid for by the contributions of thousands of poor immigrants and the “103 prominent citizens who pledged $1,000 each.” The cornerstone of St. Patrick’s Cathedral was laid in 1858 and the opened in 1879 under Archbishop John Hughes. For more information or to contribute to the restoration visit http://www.saintpatrickscathedral.org/. It was time to head over to the theater. After the play, we decided to go to the Russian Tea Room at 150 West 57th Street www.russiantearoomnyc.com for High Tea. The Russian Tea Room was opened in 1927, by former members of the Russian Imperial Ballet, as a gathering place for Russian expatriates. My favorite time to visit this iconic landmark is during the holidays. We left the Russian Tea Room just in time for some power shopping. The first stop was Mac-Kenzie Childs. Who can resist the porcelain palace at 20 West 57th Street? They are offering free shipping through December 16th on orders over $200 at www.Mackenzie-Childs.com. Please Santa, fill my stocking with whimsical black and white MacKenzie-Childs goodies! I am not greedy, anything from this store will be fine. However, my absolute favorite is the amazing $525 Beverage Hostess. It is the perfect serving piece for my holiday Fa la la beverage. OK, Santa, I also love the “Holiday Holly and Berry Collection”; the placemats, table topper and tablecloth with red piping will fit perfectly in my stocking. If your elves have some spare time they can come over to my house and make my antique piano look like the one in the store. I would be so appreciative. I do love the light fixtures but I know they will not fit in my stocking. We headed to the swanky uptown Central Park neighborhood to shop at Bergdorf Goodman. If we have time before dinner, maybe we can take a horse-drawn carraige ride through Central Park. Maybe tomorrow we can travel east of Central Park to the “Museum Mile” with “more culture per square foot than anywhere else in the universe.” There are 10 museums on this stretch of Fifth Avenue on the Upper East Side. The Metropolitan Museum of Art at East 82nd Street has interesting limited-time exhibitions as well as the museum’s extraordinary permanent collection. The Solomon R. Guggenheim Museum features scores of modern and contemporary masterpieces. The El Museo del Barrio, at East 104th Street, showcases Caribbean, Latino and Latin American art. We could also visit the American Museum of Natural History and The New-York Historical Society, the City’s oldest museum, which recently reopened after extensive renovations. For now, let’s go to Berdorf Goodman for some holiday power-shopping. This is my favorite store in New York City! Let’s face it, if you can’t find what you want at this store then you need some remedial shopping lessons. Bergdorf Goodman Inc. is the only premier luxury store situated solely in New York. They have wedding dresses, shoes, antiques, and the best selection of holiday gifts on the planet! Bergdorf Goodman is celebrating their 111th year aniversary. They have the most elaborate and theatrical window displays in New York! Museum-quality display windows draw sophisticated shoppers inside this landmark art deco building. It’s the former site of a Vanderbilt family mansion. There are eight floors of elegant couture and high-end designer collections for men and women. The store is owned by the Dallas-based Neiman Marcus Group. The legendary establishment is actually two Manhattan stores situated across the street from each other at Fifth Avenue between 57th and 58th Streets. A separate men’s operation, established in 1990, is located on the east side of Fifth Avenue. They also have an elegant restaurant and bar on the top floor. When you have completed your holiday shopping mission, stop in for a drink. You can get an outstanding Vino con Vista view of the Plaza Hotel from the window in the bar. I’m buying the snow globe for my daughter-in-law. It reminds me of her! Maybe I should get the shopping Nutcracker instead; so many decisions and so little time. Macy’s on 34th Street has a million square feet of floor space on nine sprawling floors. Bloomingdale’s offers an outstanding array of holiday merchandise. I liked the dog ornaments. Another interesting New York shopping destination is Fishs Eddy at 889 Broadway (212-420-9020) in Union Square. Fishs Eddy is actually named after a tiny town in upstate New York and specializes in kitchen merchandise. You can find everything from “glassware with a vintage feel to kitschy table linens and modern barware.” They have cereal bowls and kitchen essentials with a sense of humor. Check out their flatware that starts at 99 cents, dinnerware and assorted surprises. I love their New York Skyline pattern. It’s finally time for dinner. I can’t leave New York without having a big juicy “Prime Sirloin Steak” at Spark’s Steak House at 210 E. 46th Street (212-687-4855). They have been serving legendary steaks since 1966.
http://sparkssteakhouse.com/home/ Video Overview of my favorite Steak House in NYC! Bergdorf Goodman is my favorite store and the Waldorf-Astoria is my favorite hotel in New York City. Don’t forget to stop in the Bull and Bear Restaurant and Lounge where you can watch the Ticker Tape! Have brunch in the main lobby under the Statue of Liberty clock. Pick up some cool merchandise in the gift shop. I loved the books: Things a Woman should know about Style” and “Fifty Dresses that Changed the World.” They both have Audrey Hepburn on the cover. Check out the window displays to see the roster of famous guests. 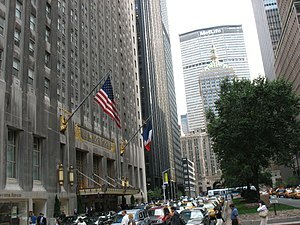 The magnificent Waldorf-Astoria Hotel is a luxury hotel located at 301 Park Avenue. This 47-story Art Deco Landmark was designed by architects Schultze and Weaver in 1931. Between 1960- 1978, Guy Lombardo and The Royal Canadians televised their annual New Years Eve show live from the Grand Ballroom. 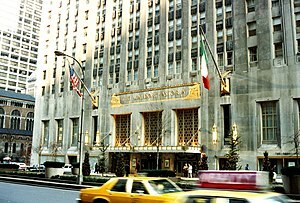 John Jacob Astor IV, built the Waldorf Astoria. He died on the Titanic. His second wife, Madaline, was seven months pregnant and surivived the sinking ship. 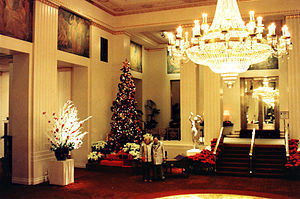 We must rush over to the InterContinental New York Barclay for a yummy hot Cream Toddie! We call that Mom’s Moonshine at our holiday parties. Situated just off fashionable Park Avenue at 111 E. 48th St. (48/Park) , the InterContinental’s central location is in the heart of Midtown Manhattan’s East Side. The fabulous Cream Toddy is had with apple brandy and apple cider. For every Cream Toddie sold, $2.00 is donated to the Food Bank of New York City. The bar has the largest French Apple Brandy selection in the US. I’m buying some Calvados Chateau Apple Brandy when I get home so I can be an Ambassador too. 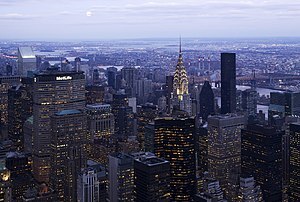 Visit www.intercontinentalnybarclay.com for more information. 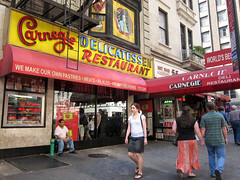 The Carnegie Deli has the best sandwiches in town. 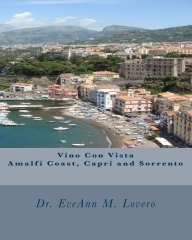 Little Italy is packed with great restaurants. Dine at Balthazar in Soho. Buy the cookbook and make the Braised Ribs when you get home. You will be the envy of all your Foodie Friends! When you go to New York City, buy a ticket for the Hop-On, Hop-Off double-decker bus that includes the Downtown Loop, Uptown Loop, Brooklyn Loop and Night/Holiday Lights Tour (Brooklyn and Night/Holiday tours are not Hop-On, Hop-Off). You can also select a 72 Hours All Loops Tour. Once you’ve enjoyed the scenery from amid the skyscrapers, you can visit the bridges. This vantage point allow you to see all of Manhattan in perspective. Cross the Brooklyn Bridge and visit the Brooklyn Heights Promenade. 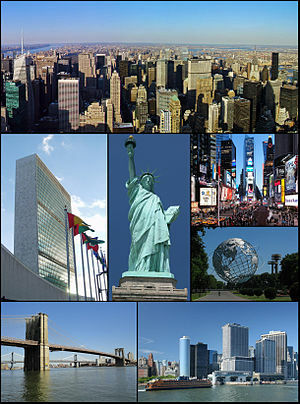 For more information visit: Architecture of New York City and List of tallest buildings in New York City. These pictures are fantastic! 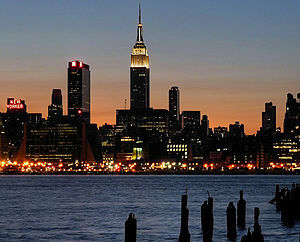 Makes me want to travel to New York as soon as possible! Who doesn’t love Bergdorf Goodman and the Waldorf-Astoria!! 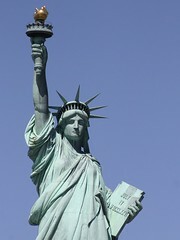 I’m going to try and visit NY this summer!